We’d love your help. Let us know what’s wrong with this preview of The Cypher by Julian Rosado-Machain. The other is the story of Th GUARDIANS INC.: THE CYPHER is two stories in one. A glimpse into a multinational company that is in reality the oldest of secret societies, one that spans close to seven thousand years of existence, weaving in and out of history, guiding and protecting humanity from creatures and forces that most of us believe are only mythology and fairy tales. To ask other readers questions about The Cypher, please sign up. Why can't I get the whole book to read? Best Book of All Time! Thomas loves his grandfather a lot and, now that his parents have died, it's just the two of them. While helping his grandfather look for a job, Thomas comes across an ad that, at first, looks to him like some funny language, but the next time he looks at it, the funny symbols are gone. That ad leads them to the Guardians, Inc mansion for an interview to be the assistant librarian. By the end of the day, both he and his grandpa have jobs there ... and that's only the beginning of the adventure. Thomas loves his grandfather a lot and, now that his parents have died, it's just the two of them. While helping his grandfather look for a job, Thomas comes across an ad that, at first, looks to him like some funny language, but the next time he looks at it, the funny symbols are gone. That ad leads them to the Guardians, Inc mansion for an interview to be the assistant librarian. By the end of the day, both he and his grandpa have jobs there ... and that's only the beginning of the adventure. I liked this story. Not loved, but liked. It was unique and fun. I think it would be good for the younger ages, possibly elementary school, and a great chapter book to read with your children who are just starting out. The adventure is fun, but there were parts of it that disappointed me and I felt as if the author was talking down to the child. I do look forward to reading books 2 and 3 to find out where the story goes and see if the writing gets better as the series continues. Attention readers! If you love Artemis Fowl or Fever Crumb, you definitely want to read this book. I’ve been a fan of books for younger readers nearly all my life. My father, a librarian, got me started on Newberry Award books at an early age. This led to my branching out to other authors who write for the same age group. Today, some of the best new literature being published is in this category. I’m pleased to say that Guardians Inc.: The Cypher is one of those books. A key to success in this category, or really any good book, is getting and keeping a reader’s attention. Some authors struggle with this in their early work. Fortunately, The Cypher hooked me from the beginning. And kept my attention right through to the very end. I planned on working this book in between my other projects. That wasn’t possible because I stayed up to finish the book the first night I picked it up. If you or someone you know is an avid reader, this is one of the litmus tests for a good book: the harder it is to put down the better the book. As you can tell, I fell for this book hard. Like many of the best stories in this category, an altered reality is presented that walks the line between science fiction and fantasy. Science, reality, and magic blend successfully with a strong, interesting result. The book does contain fighting and physical action, so parents may want to gauge access accordingly. However, I didn’t find any of these scenes to go beyond anything found in a Harry Potter novel. I truly hope you’ll find this book. It’s a great example of why I’m on the lookout for books written for this age group. Fresh ideas and combinations, interesting characters and family insights wrapped up into a book that gave me a lot of pleasure. May it be the same for you in this book I’ve given a rare, 5-star rating. The Cypher is a mediocre mash-up of science fiction and fantasy; I didn't hate it, but frankly, I was rather bored throughout most of it and doubt I'll be reading more in the series. Some aspects were interesting--the magic vs. technology angle, the fate of Thomas (the main character)'s Grandpa, the allusions to Lovecraft--but ultimately, it left me unsatisfied. Little happened, really, and the book came across as more of a beginning than a complete plot, though it improved around 80%. It also de The Cypher is a mediocre mash-up of science fiction and fantasy; I didn't hate it, but frankly, I was rather bored throughout most of it and doubt I'll be reading more in the series. Some aspects were interesting--the magic vs. technology angle, the fate of Thomas (the main character)'s Grandpa, the allusions to Lovecraft--but ultimately, it left me unsatisfied. Little happened, really, and the book came across as more of a beginning than a complete plot, though it improved around 80%. It also definitely needs an editor; the author seems to have particular difficulty with commas, but there were various other typos and grammatical errors throughout. The editing wasn't horrendous by any means, it should have been looked over more thoroughly by a professional before publishing. This book is one of the few I have come across lately that got me excited to read more. The story is fresh and not overdone in the YA genre. The characters, Thomas in specific is well developed and the conundrum between good vs. evil, truth vs. appearance etc was a nice twist and a delightful alternative to the love triangle that so permeates this genre. The plot line, fresh yet comfortable had the reader, in this case me, turning the pages as quick as I possibly could. It moved fast and the breaks for the reader to breath between action scenes were never overly drawn out. I found the authors ability to incorporate so much of our physical world, modern day literature and some of the great all time literature into the story amazing as it is kept logical and adds to instead of taking over the general story line. The ending, well now, I am not usually a fan of cliff hangers but this one, I can live with. All in all a 5 * read and one I will recommend to all lovers of the YA paranormal genre. Go on. Get a copy. You know you want too. I absolutely loved it, cant wait to get the next book! Disclosure: I won a copy of this e-book through the LibraryThing member giveaways. A honest review was requested. Later, not realizing I already had it, I also purchased it for myself through Amazon. All opinions are my own. Synopsis: Guardians, Inc: The Cypher is two stories in one. A glimpse into a multinational company that is in reality the oldest of secret societies, one that spans close to seven thousand years of existence, weaving in and out of history, guiding and protecting humanity from creatures and forces that most of us believe are only mythology and fairy tales. My Thoughts: I really enjoyed this book—it builds up slowly but steadily. I could not help but be really jealous of Thomas and his work at the huge library hidden away by Guardians, Inc., with access to every book in existence. What a dream come true for a bibliophile like me! The characters are wonderful. Thomas is the one we learn the most about, of course, but others are equally interesting: Tony, Tasha, the Butler, Dr. Franco, even Click. While some are only mentioned in passing, we are given at least a glimpse into their persona—it’s very well-done. I wouldn’t be surprised to find some folks complaining about the pace—it starts a little slow, but it’s all necessary. I think the second book will be a firecracker and I’m very excited to start reading it. I’m especially hoping that we will learn more about Magic and the various magical races. This one had mostly fauns, with some Wraith and the grotesques. I also hope we’ll learn more about how Lovecraft’s mythos fits in, because it is emphasized a few times that Thomas needs to read Lovecraft. I picked this novel up for free on Amazon. On the good side, the book has some interesting ideas, including a somewhat different take on elemental beings. Unfortunately, the book's many bad qualities overbalance its good ones. One, it badly needs more copy editing. I understand that English is not the author's first language, but that doesn't mean the poor word usage isn't there. Two, I often had trouble following just what is being described or is supposed to be happening. For instance, it was ne I picked this novel up for free on Amazon. On the good side, the book has some interesting ideas, including a somewhat different take on elemental beings. Two, I often had trouble following just what is being described or is supposed to be happening. For instance, it was never clear to me whether the protagonist's coalition was trying to prevent either a dark age or a mass-extinction event. Three, the supposedly competent adult characters keep behaving irrationally. For example, the main character has special abilities that are essential for their cause, yet the apparent leader of the coalition risks him as bait two times over the course of the short novel for purposes that are obviously not commensurate with the protagonist's value. There are other examples. To summarize with slight exaggeration, everyone behaves like an idiot. very highly recommended. Character,plot and locations so finely drawn! This review has been hidden because it contains spoilers. To view it, click here. It has been a while since I've read a young adult novel, and I spent an enjoyable afternoon out on the porch reading this one. I was immediately intrigued by the basic premise of the world inside the book: Magic is held back by technology and the efforts of a secret organization. Every 500 years, there is chance to upset that balance. Through a series of events, the main character, Thomas, discovers that he has special powers and that he must become a part of the secret organization and help sav It has been a while since I've read a young adult novel, and I spent an enjoyable afternoon out on the porch reading this one. I was immediately intrigued by the basic premise of the world inside the book: Magic is held back by technology and the efforts of a secret organization. Every 500 years, there is chance to upset that balance. Through a series of events, the main character, Thomas, discovers that he has special powers and that he must become a part of the secret organization and help save the world, and with it, his grandfather, who has been kidnapped by the opposing forces. This is a neat little book. Thomas is fifteen when he discovers an ad for an assistant librarian position with an odd company, and gets an interview for his grandfather. From there, things take off in a magical tailspin, with the company existing just between magical and non-magical. I liked it quite a bit. It's an easy and quick read but it's pretty entertaining and I recommend it for fans of magical realism. This book was very imaginative about ancient writing. What I like about this book that Thomas can die easily. I thought from the start that Thomas would be invincible . I also like this because the names remind me of a game I play. This is the best book I've read from Amazon so far. The Cypher is a half mythological or magical, half modern time book. A boy named Thomas and his grandfather are in a race to find the book of Concord. They are both on different sides. I liked the magical part. Great book! Loved it from the start. I am not sure who I heard about this book from.. and I had a few trepidations about it.. But I was thrilled with how good it was! Really good idea, but the editing and the characterisation were both thin on the ground. This book was supplied to me by the publisher on condition that I present a true and honest review for it. When I came to the end of Guardians Inc.: The Cypher, I felt exactly the same way I felt when I came to the end of the first part of The Gulag Archipelago. I felt a bit stunned, almost poleaxed. Where's the rest of it? I had been turning pages as fast as I could read, trying to get to the end of the story, and suddenly (to mix my metaphors badly) I twisted my ankle because the staircase stopped when I was still going down it. In both cases, I was immediately informed. The rest of Gulag hadn't been translated yet. This story continues in Guardians Inc.: Thundersword. Gee, thanks. When can I get my hands on it? That is not to say that The Cypher is of the same literary quality as Gulag. It isn't. It's a YA fantasy, of the kind that has today's world interacting with magic. It isn't quite heroic fantasy; it isn't quite urban fantasy. It is something different from either, but it partakes of both. The similarity to Gulag lies in the fact that it grabs the reader on page 1 and doesn't let go. It is initially set in Carlsbad, California, which was a small town when I lived nearby fifty years ago. I gather from the book that it is now quite a city. Thomas Byrne, 15, lives there with his grandfather Morgan Byrne, since his parents, and the cruise ship they were on, totally vanished some six months earlier. His parents' insurance won't pay off because there is no proof his parents are dead, so his grandfather, at 72, is trying to find a job so that Thomas can go to college. Thomas is an intelligent though not overly studious youth. He is a red belt in tae kwon do, only one step below black belt, and when three juniors ganged up on him, the juniors wound up in the principal's office somewhat the worse for wear, while Thomas wound up in the office of the assistant principal, who actually runs the school and who telephones his grandfather. As the book opens Thomas is sitting in the outer office waiting miserably to find out what his punishment is going to be, when he hears his grandfather and the assistant principal, Miss Khanna, better known among the students as Killjoy, laughing behind the closed door. For appearance's sake, and to keep Thomas from getting in more trouble with more students, he is suspended for a week, but is privately told that the suspension won't go on his school record. The three bullies, who will not be allowed to play in the championship football game that weekend, are in considerably more trouble. Before the end of the first day of his suspension, both Thomas and Morgan are employed by an international corporation which is not what it seems. No matter where you want to go, you can go out one of doors of the building and get there. Wherever you are, if you want to enter the building, you go two and a half blocks to your left and there it is. Morgan is hired to oversee a financial department of the corporation; Thomas is hired as an assistant librarian. Every book that has been written, even if it exists nowhere else in the world, in the last 1700 years is in the library, which he doesn't have access to from his work station. But that's all right, because the books are automatically delivered to his desk when someone asks for them. When the library is quiet, he is allowed to do his homework using the books and computer assigned to him, but other than that, he may make no personal use of any of the books, even those by his favorite authors and believed to be lost, and he may make no personal use of the computer. Within the next month, Thomas's grandfather is abducted, his house is burned, and Thomas goes to ground in the corporation headquarters, with a robot (actually more like an android) butler looking after him. He is to be homeschooled, and he acquires an extensive bodyguard including an elf princess who looks seventeen but is about 3000 years old and who guards him with magic. He soon learns that there are far more magical creatures than he ever suspected, and all of them want him. Why? Because he, and his grandfather, are human Cyphers. They can read any language ever written and translate it into English, though this does not extend to understanding the spoken language. Every five hundred years, a supernatural being comes to earth and writes the history of the next 500 years. That allows the defenders of order to protect the world from the orders of chaos. But twice the book was not found--only a Cypher can find it--and each time, bad things ensued. Now it is late. The last version's last prediction was for 1905. The result has been a series of wars, natural disasters, famines, and other problems the defenders of order could have predicted. By abducting Morgan, the forces of chaos have acquired their own Cypher to look for, and translate, the book, and they have managed to convince Morgan that they are the right side. But having their own Cypher does not mean they will necessarily reach the book first, because Thomas is a Cypher belonging to the forces of order. They want to kill him. To go farther would be to risk creating a spoiler. So I will say only this: If you want to read a strong page-turner, it doesn't matter whether you are in the intended YA audience. I am 69. And I hope I live long enough to finish reading the trilogy this appears to be the beginning of. This book was an interesting read for me because I had no idea what to expect. The story centers around Thomas, a 16-year-old boy who discovers that not only does magic exist, but it is only being kept from overtaking the world because a company called Guardians Incorporated has been working to keep Magic and technology in balance. But, Magic has slowly been gaining the upper hand and the Guardians need a special person who can find and read the Book of Concord, a book foretelling the future. Th This book was an interesting read for me because I had no idea what to expect. The story centers around Thomas, a 16-year-old boy who discovers that not only does magic exist, but it is only being kept from overtaking the world because a company called Guardians Incorporated has been working to keep Magic and technology in balance. But, Magic has slowly been gaining the upper hand and the Guardians need a special person who can find and read the Book of Concord, a book foretelling the future. This book is the only thing that allows the Guardians to stop Magic from overtaking technology. Thomas is the only person who can save humanity. Rosado-Machain did an excellent job of creating this world within our world. This book had some really unique ideas and tons of interesting human and non-human characters. This is actually part of my last point, but I wanted to point it out specially because it was so fun! Much of the first half of the book takes place in a supernatural library where lost books (and many never-heard-of editions by famous authors) can be checked out by those who have clearance. There were some fun and witty scenes where you see someone checking out a magical book and then returning the book looking rather worse for wear. You are given some clues as to what went wrong, but a lot of it is left up to your imagination! There were some really fun characters in this book, including an android and a crazy New Yorker who added a lot of color to the book. After reading this book, I read that Rosado-Machain is not a native English speaker and that explained a lot of things. I kept wondering how someone who was obviously well-read and intelligent author could make so many grammatical mistakes (his numerous references to fantasy books were peppered throughout the book in a way that I loved!). Unfortunately, he book needed a much more thorough editing job. Often words were used incorrectly or there were obvious grammatical errors. I have to tell you that this is something that REALLY bothers me when I'm reading a self-published book and it's usually a deal-breaker that causes me to give the book a very low rating. In this case, though, I thought that the story had real potential and that the concept and ideas were great, so I was able to overlook the grammar and enjoy the book for the most part anyway. I really feel like Rosado-Machain's editors let him down. The lack of emotional impact. As I said, I enjoyed the story that was being told here. My one problem was that, while great detail is given about what Thomas sees, hears, smells and touches, the author very seldom gives us a glimpse into what Thomas is feeling. This caused a disconnect for me. I didn't get a true sense of awe, fear, hope or pain from Thomas (even though incredible things are happening all around him). Since the story is told from Thomas' point of view, I want to really understand how he is being impacted by the events in the story, but I felt like I had to supply that for myself for the most part. This is especially noticeable when it comes to the romance portion of the story. It is just never believable to me that Thomas finds himself "in love" with Tasha and then when things go terribly wrong (I won't spoil how), I felt like he barely reacted. It was very odd. A dash of science fiction, a dash of fantasy…Guardians Inc.: The Cypher was a story that was oh so familiar and oh so original at the same time. It’s like Julian Rosado-Machain took everything that I love about middle grade children’s fiction and slammed it into one awesome, well-paced fantasy. It had a mysterious society, good guys, bad guys, in between guys, gargoyles, elves, principals that are skilled at every form of martial arts (and then some), and a mysterious book of prophecies that cou A dash of science fiction, a dash of fantasy…Guardians Inc.: The Cypher was a story that was oh so familiar and oh so original at the same time. It’s like Julian Rosado-Machain took everything that I love about middle grade children’s fiction and slammed it into one awesome, well-paced fantasy. It had a mysterious society, good guys, bad guys, in between guys, gargoyles, elves, principals that are skilled at every form of martial arts (and then some), and a mysterious book of prophecies that could determine the fate of the world, among other things. The story focuses on fifteen year old Thomas and his grandfather, Morgan. After responding to an ad in the paper, he and his grandfather are hired to work for Guardians Incorporated, a business that Thomas quickly discovers is much more than it seems. Guardians Inc. not only has their hand in economics, marketing, medical research, historical restoration and international relations, but they’re also responsible for maintaining the balance between technology and magic. When it’s discovered that Thomas and Morgan are Cyphers, people with the power to translate any written language, Thomas’ grandfather is kidnapped by an opposing society. An interesting and practical power to have, all things considered, and we get to see Thomas put his skills to good use as he explores the underground magical culture and discovers that with his newfound gift, the fate of the world rests in his hands. While Thomas was most definitely the main character, the relationship with his grandfather was one that felt genuine and loving. Morgan was very much a conscious presence throughout the book, even when he wasn’t even there. Julian Rosado-Machain definitely has a talent for writing characters, and even alone, Thomas was very likable. For a fifteen-year-old, he was surprisingly flexible, and eager to do what needed to be done in order to save the world. He had a good heart and a passion for learning and reading classics such as 20,000 Leagues Under The Sea. The supporting characters were just as strong, and colorful. There’s Henri, a gigantic stone gargoyle and the muscle of the group, Bolswaithe the robotic butler, Tony, a former leader of Guardian Watchman team, Vice Princepal “Killjoy”, who is far from what she appears to be, and Tasha, a beautiful elf who may or may not have a thing for Thomas. Together, they provided an even balance of skills and dialogue needed to move the story along at a fun and interesting pace. So when it comes down to it…Do you like Percy Jackson? Fablehaven? Harry Potter? 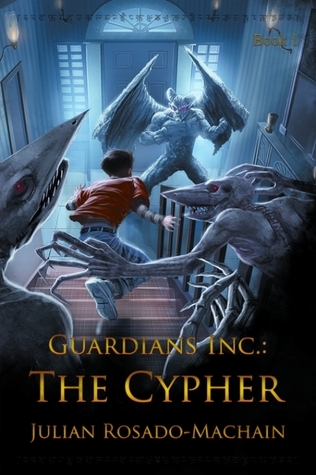 Guardians Inc.: The Cypher shares a little from each of these middle-grade favorites, but spins them into a brand new and exciting adventure. Check it out, if you like what you see! You won’t be disappointed. Oh, and I also recommend that you check out the website. It’s just as entertaining to browse through as reading the book! You can find more information at http://www.guardiansinc.com/. The Cypher, book one in the Guardians Inc series, is a well-written story for tween and teen readers. The main character, Thomas, is an almost sixteen-year-old boy whose parents mysteriously disappeared several months back. Obviously, things are not calm in his life, but they’re about to get shaken up even more as the book opens. And from there it just gets fun. Julian Rosado-Machain knows how to write a book that appeals to the teenage need to feel or be special. He avoids making Thomas into a s The Cypher, book one in the Guardians Inc series, is a well-written story for tween and teen readers. The main character, Thomas, is an almost sixteen-year-old boy whose parents mysteriously disappeared several months back. Obviously, things are not calm in his life, but they’re about to get shaken up even more as the book opens. And from there it just gets fun. Julian Rosado-Machain knows how to write a book that appeals to the teenage need to feel or be special. He avoids making Thomas into a super-hero by engaging some very realistic limits. Thomas has one special power in The Cypher and that’s it. He can’t read minds, can’t bend steel, anything like that. So it’s easy to imagine that, theoretically, something like that might really happen to the reader. There’s definitely a certain appeal to that even I could recognize. I loved the pieces of The Cypher that focused on Thomas and his grandfather. I think that the bond between grandchildren and grandparents is a special thing that we don’t see portrayed nearly often enough. You could sense that Thomas really loved and respected his grandfather. And also that the grandfather felt the same way about him. I hope in future books we can see more of the two of them together. (At least once Grandpa is back to being Grandpa again.) I’m tempted to keep reading the series just to see if that happens. The Cypher is one of those books that definitely fall firmly into the “science fiction fantasy” category. Technology, robots, elves, magic, and quantum physics all merge seamlessly within it. There’s even a bit of H.P. Lovecraft’s sandbox mentioned within it. With a bit of classic good-versus-evil, plus a side bit of Thomas learning about the problems with hormones, and some loveable characters, it’s a book that’s easy to like. There are also some scenes where the sheer ridiculousness painted (like the Grotesque waving an energy drink banner) will make you snicker. The dialogue is believable, the action is good, and the plot moves along fairly quickly. The few issues I had with it were fairly minor. (Ex: Thomas ends up in some situation no adult in their right mind would put him in.) Everything was fairly obvious to me as an adult reader, but even then I still enjoyed it. While job hunting, Thomas Byrne and his grandfather Morgan stumble upon a multinational company called Guardians Inc. It turns out that Thomas is a Cypher and much wanted by both Guardians Inc and the Warmaster. Every 500 years the Oracle comes back to Earth and the balance between magic and technology gets all wonky. Depending on who finds all the Oracle’s clues, the balance could tip either way, to magic or technology. If magic wins, humans lose though so it’s a race against time. This story grabbed my attention from the beginning. There are parts where I rolled my eyes a bit too much, but for the most part I enjoyed it. Thomas is almost 16 so this is a YA, but there’s magic and creatures and a fight between two factions. In fact, just about everything except the kitchen sink is included, so it does get a tiny bit confusing at times. It’s obvious at the end that the battle is only just beginning. There is a stopping point, but no real resolution. An enjoyable read nonetheless. This book never let me down, it impressed me. Technology vs. Magic, that's 100% awesome. I really love books with this character who have no idea on what he's capable of and then one day he became the most important man that will save the world. This book was mixed with mythology and science, history and disasters happened that the author gives a new possible cause that will reach the farthest part of your curious mind. Hands down to you Mr. Machain. A cute story that has a wonderful premise. I am interested in picking up the rest of the series. I loved the characters and the plot. There were only a few minor details that annoyed me (so minor I can't remember them by the end of the book). Overall it was well written and well planned. The book was just okay. There were magical elements, non-magical elements, but it seemed like the storylines just didn't mesh together. There were chapters reminiscent of Harry Potter, some of Kane Chronicles, some of even Fablehaven, but it was choppy. Some brilliant ideas in the book that would have made the story a lot better had the storyline been more focused. Thomas is just a regular boy living with his grandfather until an unusual newspaper advert changed both their lives forever. Full of action, suspense and a touch of romance. I loved this book and will definitely be reading the next one! I have gone on the web site and I think I would most likely, or would love to play the fierce Tasha! I would love to read this book. Puzzles, cyphers, and thrilling story lines really make you stay awake all night just to keep it going. Eh. Reads like the intro to the series, not a whole book in and of itself. Some fun ideas and characters, but it's a quick breeze through, not an in depth look at anything. I am looking for it now.